Almost two years ago, october 1999, I was looking for a new watch. 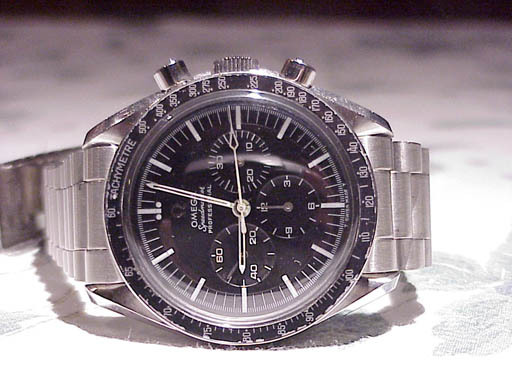 It had to be a Speedmaster Pro, because that was one of the nicest watches I had ever seen. 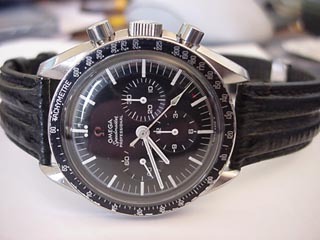 I did some research on the Omega Forum at TimeZone on Speedmaster models and I was thinking of getting a used one because I couldn't afford the full price of one. After lurking on the forum I started looking on the internet for these watches. I didn't really had a preference for a caliber 321 or caliber 861 model, there were things that could be said in favor for each of this movements. 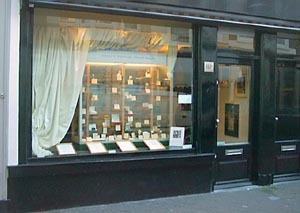 One evening, I was walking in The Hague and passed a shop called Horloge Platform Nederland. I knew this shop from the internet, so it wasn't quite a coincidence ofcourse. I passed the shop past closing time because I was doing an internship in Wassenaar and couldn't be earlier in The Hague then 18:00 or so. 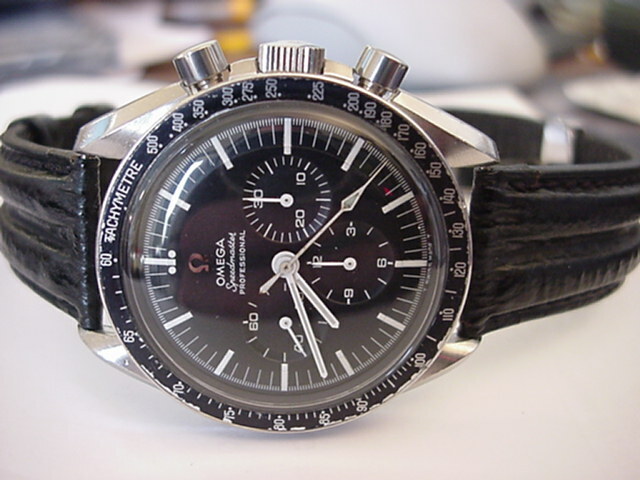 I saw two Speedmasters in the window, a 'new' never worn Speedmaster Pro from 1998 and a vintage Speedmaster Pro (ref. 145.012-67, see my reference table for explanation) from 1967. I checked the website of Horloge Platform Nederland as soon as I got home and mailed the owner of the shop, Gerard Nijenbrinks, with some questions about details on the watch. I got a reply very quickly and made an appointment to see it. The owner of the shop showed me two watches, the new one and the old one. The new one was sold already, or someone had an option on it (don't remember) but I liked the old one better. I liked the applied logo and the cal.321 movement which he showed me without (me) even asking for it. It looked marvelous and although I didn't knew anything about movements, it looked fine to me. Even a non-watchlover could tell that this was okay. The dial of the watch was very fine, the tritium wasn't on the hourmarkers anymore and the hands were a bit 'old' but it looked fine. The case had some scratches on it, but that isn't strange for a +30 year old watch. The bezel was a bit scratched too. After some talking we agreed on the price (very fair) and paying I left the store with a happy smile on my face. Above you see the watch how I got it. However, I bought it with a nice leather Cornelis Kauffman strap and later on I purchased a NOS bracelet (more on the bracelet later). As I said, the tritium wasn't on the dial and hands anymore but they were still original. 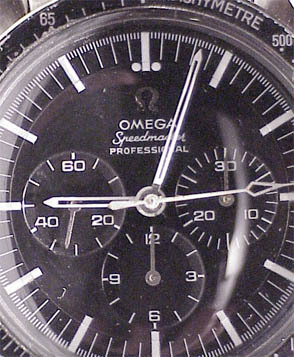 It is especially the chronograph second hand where I am very proud of. You don't see them much anymore, a lot of these hands have been replaced through the years. 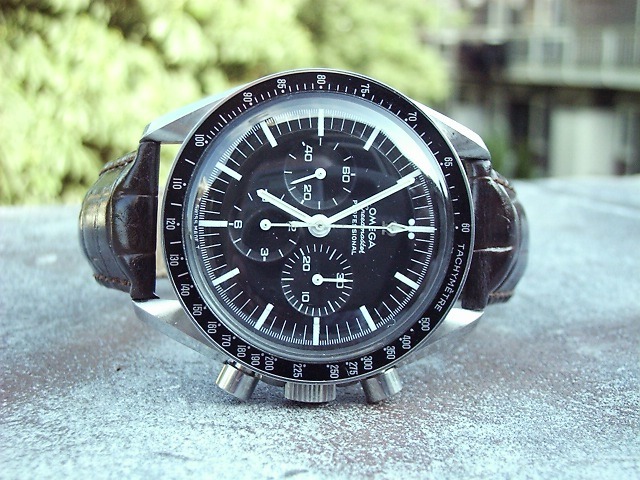 See my article about chronograph hands here. I bought a Bergeon caseopener somewhere in Antwerpen/Belgium where I was staying a weekend so I could see the movement 'tick'. The old caliber 321 movement performed well and it didn't need any regulating. 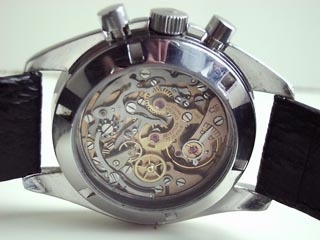 The cal.321 movement was produced since 1946 and used in the Speedmaster Pro till october 1968. 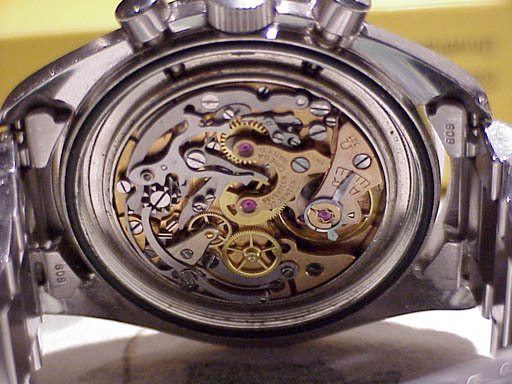 After that, they started using the cal.861 movement, which had lesser parts and thus cheaper to produce for Omega. 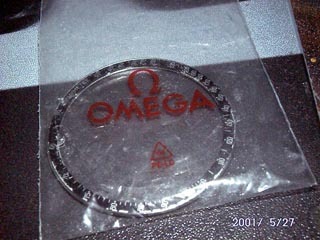 Omega used it till 1997. Nowadays, they use the cal.1861, which has a nicer finish and an extra jewel (18). The original caseback had some scratches on it (the light maked it worse on this picture) but I don't really care for that. The pushbuttons and crown were also original Omega. The hesalite crystal also has the 'Omega' sign in the middle. The bracelet, where I was talking about before, was bought from Pjer Strolenberg. 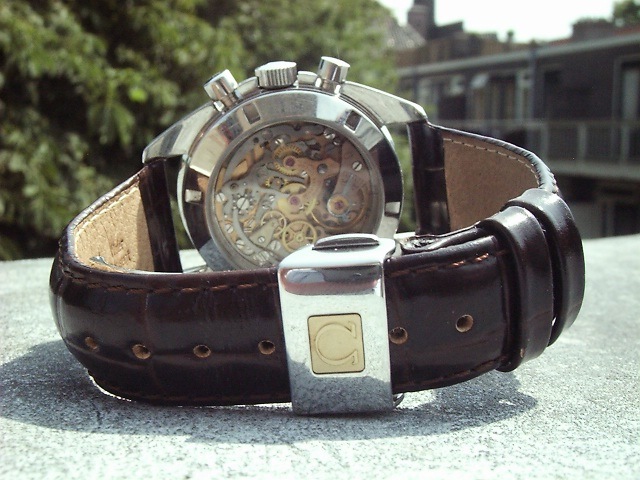 An editor of a Dutch watchmagazine and collector of all kinds of watches. He didn't had any purpose for it as he wore his Speedmaster pre-Professional on a NATO strap and it was NOS (New Old Stock). Not a single scratch. The bracelet is ref. 1450 and a full overview of the used bracelets by Speedmasters can be found here. 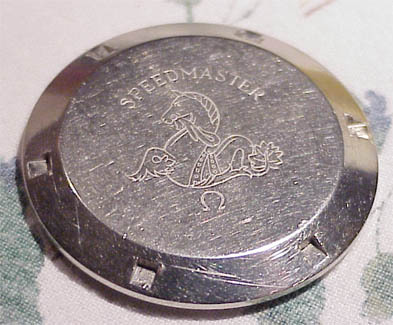 Ofcourse, I didn't sell the original pre-Moon Speedmaster caseback and am still keeping it safely in my drawer. Some time ago, I decided to do an overhaul on the watch. The scratches on the bezel started to irritate me and the hands needed to be replaced. My resetbutton wasn't also working properly, because the inner tube of the resetbutton wasn't original and didn't 'touch' the resetmechanism properly. I brought it to the repair-department of Horloge Platform Nederland, which is done by mr. A. Gaemers, a person who has quite some reputation in the Dutch 'watchscene'. They fixed my watch within 4 weeks (they had to wait for the parts) and applied a new pair of hands. 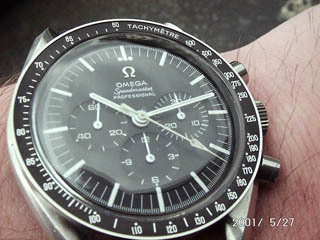 The original 1967 chronosecond hand was unavailable at Omega and they left the old one on the watch (gladfully!). There were also problems getting a 'suited' bezel for my watch. It now looked like this, and I was quite happy with it. The strap is a Kauffman btw, I like the watch better on a strap than on a bracelet. Some weeks ago, the goldsmith who made my displayback visitted me and borrowed my Omega Time Capsule book and told me that he could find a suitable bezel without a problem. After a week, he called me and said he had found the bezel that would fit my watch. The goldsmith, Gerton van der Laan, brought the new bezel and attached it within 2 minutes. The old one is shown above. The watch, as it is now, is shown below. The item that would really finish this watch would be an originial Omega folderover clasp, since I wear this watch on a strap most of the time. After some aftermarket deployant clasps from Equation of Time and TimeDesign I decided that I definately needed an Omega foldover clasp. I ordered one at a jeweler in Germany (my parents live nearby the German border) and after 2 weeks it arrived. I needed a new strap (I have piles of them anyway) because the foldover clasp was 16mm and my other straps were all 18mm at the clasp (and 20mm between the lugs ofcourse). So I went to a local jeweler (next to my house is one) and bought a brown crocograint Hirsch-strap. 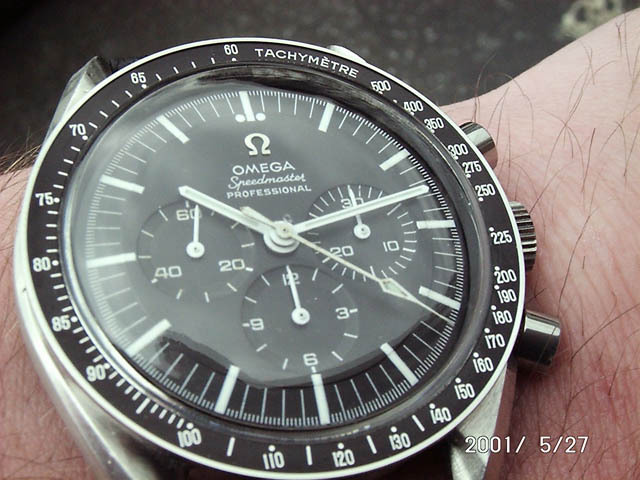 In the last 2 years, I have read almost everything on the Speedmaster by reading the available Omega books, meeting other Omega 'addicts' and hanging around on the Omega Forum (for almost 2 years now). 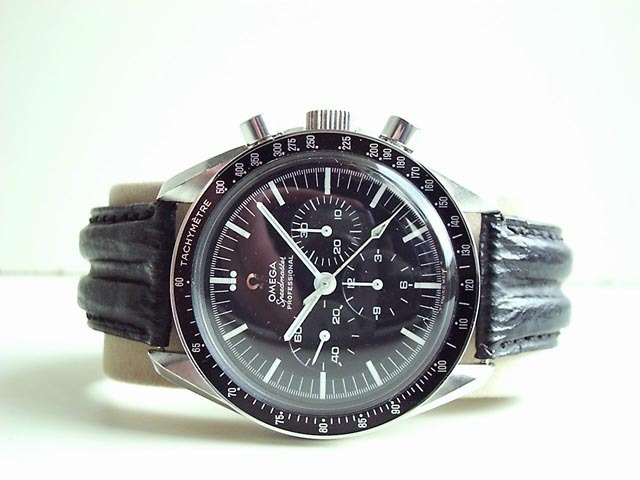 I've also started my own website, Omega-Addict to share my knowledge and passion of these watches. After almost 6 years since the initial review, it is time for a short update on this watch. Nothing much has changed, except that the mainspring broke and I couldn't find a replacement for almost 2 years. I also found a NOS chronograph secondhand at Ofrei.com. I think I paid about 14 dollars for it. 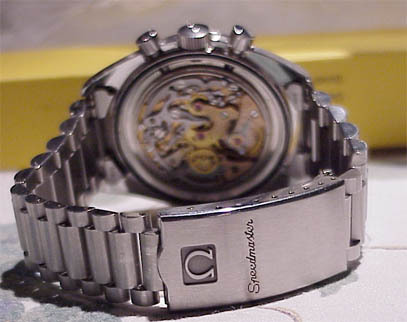 When I had it replaced by an Omega dealer in Germany (the same as where I bought the folding clasp, as you can read in the initial part of the review), he also noticed that the mainspring broke and offered to have it repaired for about 90 euros. This is probably only a fraction of the price that Omega Switzerland would have asked. Anyway, the watch works like a charme again. The watch is currently featuring a dark brown strap by Officina Italia - Bros (type: Dakota) and it looks stunning. A brown strap makes the dial really stand out. I have to admit that I do not wear this watch very often. I really love this watch and still think it is one of the nicer chronographs around, but to use this watch as a daily time piece is almost a crime. If something happens to it, I would get very upset. For daily use, I found another great classic time piece (also used by a lot of astronauts during the moon race), a Rolex GMT-Master. 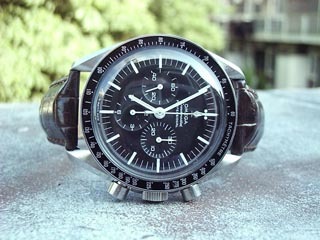 After over 7 years of ownership, this is still my favorite Speedmaster Professional model. I have had a few more recent models next to this one, but the caliber 321 with the nice metal applied logo really stood out. I sold all other models again ofcourse. 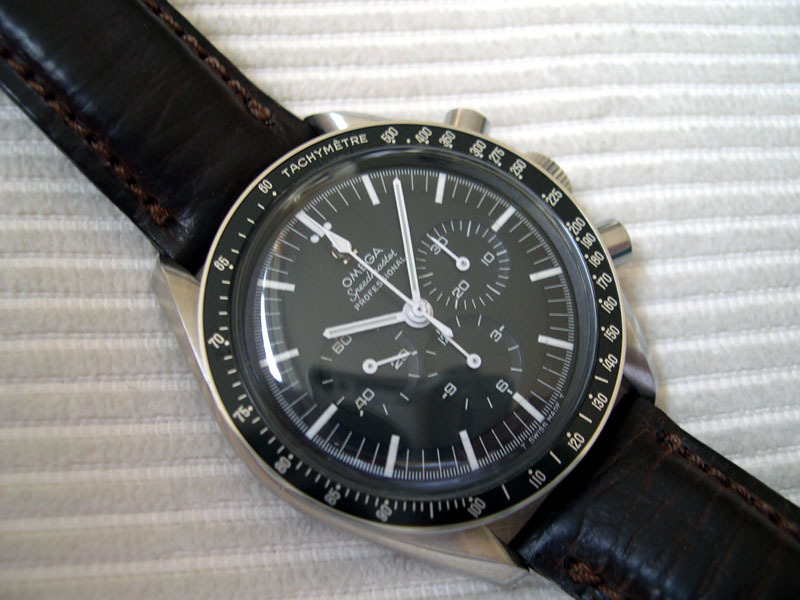 Perhaps the moonphase model (either 1985 model or the current production) will be added to my modest collection, but for now, this will be my one and only Speedmaster Professional. I am now thinking of getting the original metal bracelet for it, the ref.1039 and re-attaching the solid caseback. The display back is a nice feature, but the fact that almost every mechanical watch features one makes me a bit displayback-sick. Even watches with movements that aren't even worth looking at (standard non-finished mechanical movements) feature a display back. As for time keeping, this watch does the job within acceptable deviations for a watch this age. It stays within -7 and +7 seconds and I think it is a bit more off when the chronograph function is being used. Since a few years, I became less active on the Omega forums and websites (including this one) as mentioned before. This is due to lack of time and lack of interest in the brand (due to their current model range and quality control problems). 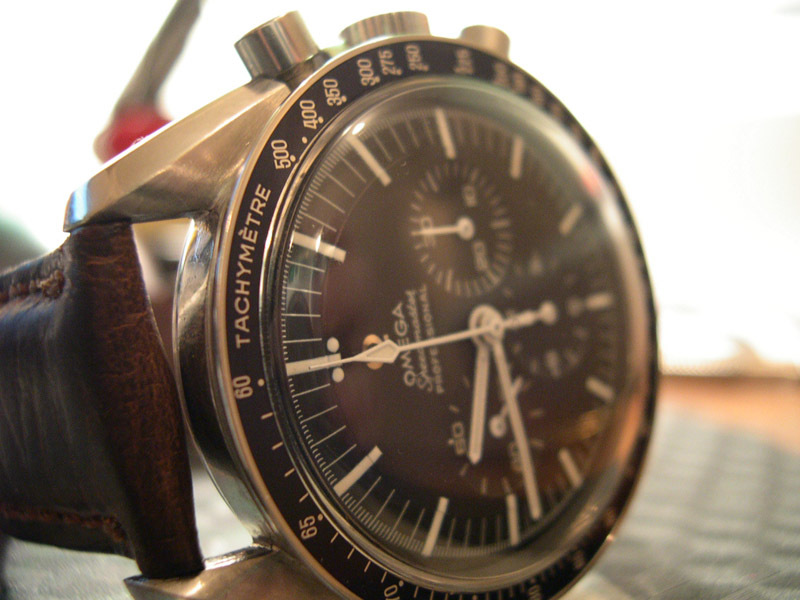 However, if you have any questions regarding vintage Speedmasters, do not hesitate to contact me.